After having enjoyed some of these mushrooms around this time last year, courtesy of our favourite vege cafe Niche Nosh, we decided to venture into the mysterious state forests near Oberon/Jenolan Caves to pick some for ourselves. 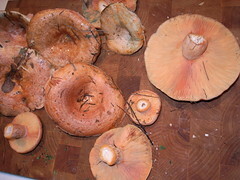 The area is famous for these mushrooms - called Saffron Milk Caps, or Pine Mushrooms - which look disturbingly toxic but are in fact safe and delicious. After some very helpful advice from Oberon's tourist info centre, we set off armed with wellies and lots of enthusiasm. It hadn't rained for a while so it took a bit of time to collect enough for lunch, and in our intial enthusiasm we nearly got lost. Note to file: when ploughing determinedly into a dark forest in search of mushies, be sure to remember where you parked the car. But all was well and these beauties delivered a fabulous fry-up lunch, which tasted all the better for the fact that it was a working day and we both really should have been doing something productive.